Tyylikkäät huoneistot San Nicola (Palermo), jossa uima-allas (käytetään vain yhteensä 3 kpl) ja suuri terassi kauniilla merinäköalalla. Talo on vastikään rakennettu vanhan kiven ja sisustettu hyvin kauniisti. Pysäköintialueen sijaitsee aidattu omaisuutta. Aamulla voit nauttia kulttuurista ja iltapäivän rentoutuen uima-altaalla tai läheisellä rannalla kylässä San Nicola. Access to the property is very narrow if you had anything bigger than a Mini it would be difficult. Not made any easier by the drive way which is at about 45 degrees. Lack of comfortable lounge/ kitchen furniture. No instructions about the TV or other appliances. Lack of local information, restaurants, bars, supermarkets, doctor, dentist. The swimming pool is a very good facility well maintained but getting to and from it could cause problems with very young children or anyone with mobility problems. The gardens are very good and has a wide selection of fruit and vegetables to be picked this includes an abundance of figs. I'm sad that you didn't enjoy your stay here in Casa Limone. For me it's important that my guests feel comfortable. Yes, the access to the house is narrow (often in Sicily!) and the last 50m are steep. Since 2006 we had a lot of guests with even bigger cars than your 500 Fiat. The high position gives you the nicest sea views! ;-) Near the pool we have an alternative parking place which I offer regularly to use. When my guests arrive I try to explain everything regarding house, garden, pool and village. Sometimes I miss something, but I offer always that my guests can contact me every time if there are problems, if they need help or travel advises. I love my job! I accompany my guests even to the hospital or dentists (often nobody speaks English!) and pick them up if they lost their way. I live next door and meet my guests very often in the garden and pool area. So it's not fair to say that there is no information about anything! 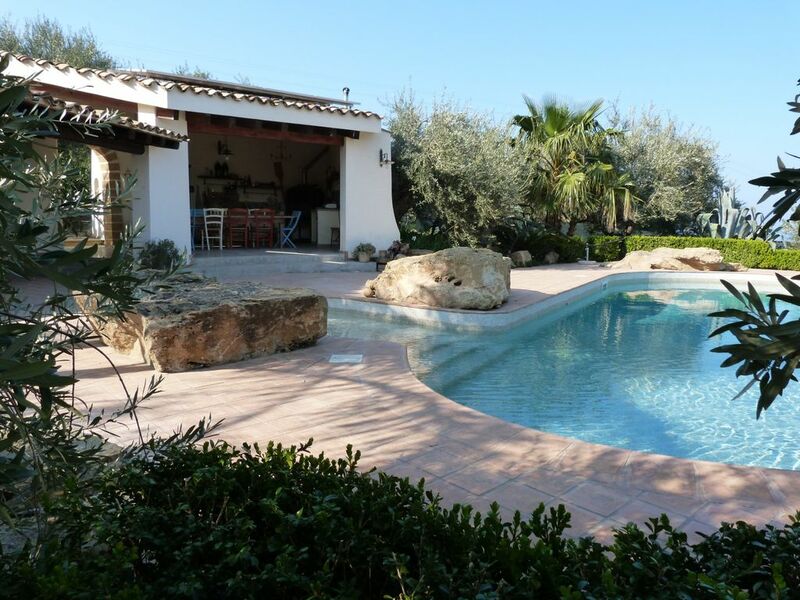 The pool is within a 180m from Casa Limone. You can reach it across our big garden with very old Olive and other fruit trees. You have to take many steps and to cross an old Roman water conduit. Generally my guest love it! But it's not suitable for guest with mobility problems like the whole houses and grounds. So, I have one important recommendation to my guests: please talk to me (by phone, WhatsApp, personally) while you here. My husband Mimmo and I will do everything possible to make you happy!!! Tolle Fewo, sehr gut ausgestattet, es hat uns an nichts gefehlt, mit traumhaftem Pool (auch der Weg dahin ist richtig schön), ruhige Lage, nette Vermieterin, angemessener Preis, werden sicher wiederkommen. Das einzige was in der Fewo gefehlt hat waren ein paar Infos zur Umgebung, ansonsten war alles perfekt, wir hatten eine tolle Zeit! Excellent stay and wonderful owner. The cottages are impeccably clean and location is secluded. Make sure you read the description on the location of the house with respect to the pool. Die Wohnungen sind gemütlich und liebevoll eingerichtet, der üppige Garten bietet fantastische Fernblicke und im Herbst ein reichhaltiges Angebot an Zitrusfrüchten, Walnüssen, Feigen etc. Wunderbar in die Landschaft fügt sich auch der Pool ein. We had a lovely stay at San Nicola l'Arena. The house and terrace were great, nice and comfortable furniture. We loved the view, the passage through the lemon trees to reach the swimming pool. And last but not least, the summer kitchen at the pool was great. One of the evenings we baked home made pizza's in the oven. Ute was very helpfull. The evening of our arrival we arrived late. She gave us pasta and tomato sauce for cooking. Fresh water and white wine in the fridge. We feld welcome!. Figs, lemons and grapes in the garden. Ute, thank you for our lovely stay! Location située à env 30-40 mn de Palerme au dessus du village (très sympathique) de San Nicola l'Arena. Cefalu se trouve à env 45mn. Plusieurs maisons sont disponibles et la piscine est partagée entres ces maisons. La propriétaire, Ute, est très sympathique et parle un peu le français. Notre maison Casa Limone était très agréable avec clim possible mais pas toujours nécessaire. Dear William, thank you very much for your comment. It was a pleasure having you as our guest. Hope to see you again! Kodit ovat varmasti yhdistää kulttuurin rentoutumista. Voit matkustaa junalla vain 25 minuuttia lähellä Palermo tai Cerfalù, ja myös laakson temppelit Agrigento kuuluu päiväretki. Meri on noin 2 km. On sekä hiekka-ja kivi rannat. Tarjolla on jotakin jokaiseen makuun. Upeasti, merinäköala on Liparisaarille. Voit myös lähteä vaeltamaan hyvin täällä Sisiliassa. Vanhankaupungin Cefalu on unelma ja tavoittaa muutamassa minuutissa. San Nicola l'Arena on mukava kalasatama, on ravintoloita, baareja ja pienet supermarketit. More info at Sisilia talossa. de Best, jos etsit loma Sisiliaan allas ja merinäköala! Für Buchungen, die nicht wochenweise erfolgen, kontaktieren Sie uns bitte. Für 5€ pro Person gibt es eine Bettwäsche/Handtuchset. Die Klimaanlage wird nach Verbrauch abgerechnet.